Naomi Spargo credits eIMACS online courses for helping her to develop a passion for math and computer science. This month's IMACS blog post is by guest author and eIMACS student, Naomi Spargo. Naomi recently sent us the following letter and kindly agreed to let us share it with our blog readers. 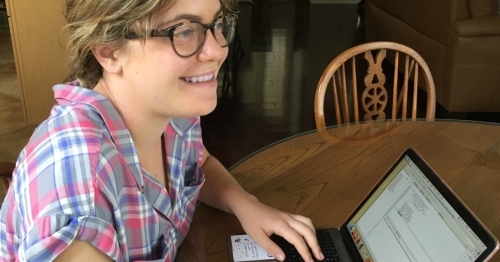 Learn more about the eIMACS online courses that helped Naomi develop a passion for math and computer science and be prepared for a summer program in Artificial Intelligence at Stanford. I recently got back from the Stanford Pre-Collegiate Summer Institutes program and wanted to let you know that it was absolutely amazing! It was very intense, but I also learned a ton. I learned about all the different techniques that fall under the umbrella of artificial intelligence such as machine learning, neural networks, and search algorithms. (I found the search algorithms that I learned in eIMACS very helpful.) I also learned answer set programming, which had a very steep learning curve for most of the class because they had never encountered formal logic before. I was at a big advantage because of the logic classes I took with eIMACS. Other than a more sophisticated approach to coding, what I took away from Stanford was a better understanding of how sprawling of a field computer science is. I've always approached coding in a very mathematical manner because mathematics has always been my strongest area of expertise. At this camp, I encountered many other coders that aren't particularly strong in math but have a heavy background in something else, like robotics. The way we approach problems is extremely different. Depending on the problem, my approach works much better than theirs or vice versa. There are so many different fields within computer science; each field lends itself to a different type of mind. I now see the need to specialize within computer science, perhaps on data analysis or cybersecurity (both math-heavy fields). 1. They helped me develop a passion for math/computers. I had a strong dislike for math classes before I took your courses because the way math is taught in schools is very dull. My biggest frustration with school math classes was how shallow the content was; we were essentially being taught to memorize symbols. Only occasionally were we offered a real understanding as to how the symbols connected. I hungered for deeper meaning in mathematics, and was doing my best to figure it out myself. The only math I enjoyed was the work I did myself with a store-bought textbook and a calculator. I didn't associate the math I did with any structured "class" because every class I had taken was slow, boring, and surface level. I was excited to learn, but my approach to learning was unorganized and inefficient. There is only so much an eleven year old can do on their own. eIMACS was a huge assist in this. Your courses explain everything in approachable language so I was not intimidated away as a young child, but gave me the deep understanding that I wanted. The content is presented in an interesting manner. The material was clearly written by someone who loves what they are doing, and the instructors who helped me with my questions share this attitude. This passion translated to me; I no longer felt alone when it came to my love of math. eIMACS courses pull off a rare trick in education; they explain complicated ideas to 11 year olds without sacrificing complexity. Your courses are comprehensive; you leave no questions unanswered. I enjoyed them more than anything I have taken in high school. 2. They gave me a competitive edge in nearly every subject. It is self evident that the three computer science courses I took with you helped me with coding. The diversity of languages you offer is a huge benefit, because certain languages lend themselves to certain problems. At Stanford, the AI class teamed up with the cryptology class to crack some numerical-based codes. Haskell, which I knew thanks to you, particularly lends itself to interpreting numerical data, so I could crack the codes much faster than students who were confined to object-oriented languages like Java. You also gave me experience with complex data structures, which most coders my age have not encountered. Similarly, the logic I have taken with eIMACS helped me with math. I often reference my tautology template when proving theorems. It gives me an organized way to express my theories and postulates. I see logic as a honing device for mathematical thought. However, the reach of these courses goes far beyond math and science. My English essays (especially the persuasive ones) often employ tautologies written out in prose form. Logic has made my writing more coherent and streamlined; it has improved my word economy because I can organize my thoughts more efficiently. My strong foundation in logic has also made me a more persuasive speaker. I do a form of debate called extemporaneous speaking, where I have thirty minutes to prepare a seven minute persuasive speech about a current political topic. Because my time allotment is so small, I need to break down complicated economic and political concepts quickly so that the average person can understand them. Using rules of logic is an excellent way to do this. My debate coach has told me I have "logos for days"; I directly attribute this to my eIMACS courses. 3. They allowed me to specialize on what I truly loved earlier than most students. eIMACS courses are so much more advanced than what most high schoolers are exposed to. I know much more about the fields I'm passionate about and can specialize sooner as a result. Most kids my age have no idea what they want to major in. Because of IMACS, this is not the case for me. I feel very fortunate to have taken eIMACS courses and am thankful to all my IMACS instructors for inspiring and encouraging me. I know that my eIMACS background has prepared me well for college and whatever I decide to do after, and I feel confident that the way of thinking logically that I learned in eIMACS will help me face any challenge.